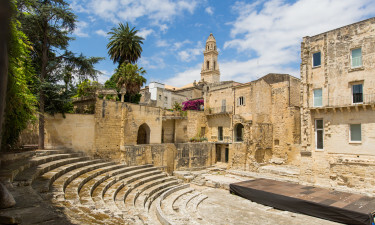 Nestled within the famous "boot" of Italy, the region of Puglia is famous for its amenable climate, its wide selection of luxury camping sites and countless examples of pristine nature. LUX-camp should be contacted to learn further details or if any additional questions need to be addressed. Why Does Puglia Represent an Amazing Camping Holiday? A wide selection of luxury camping sites. An ideal climate throughout the year. Natural settings and tranquil beaches. A proximity to historic villages and towns. 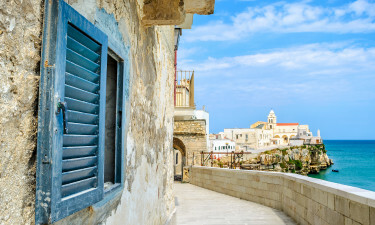 Known as "Apulia" in Italian, Puglia is located on the south-eastern tip of Italy. It is a maritime district; bordered by the Ionian Sea, the Adriatic Sea and the Gulf of Taranto. Alongside such stunning geography and climate, this region is also known to be home to some of the most diverse archaeological finds in the world. It can trace its history back to at least the Greek civilisation and historic towns such as Ostuni clearly illustrate this fact. Although the coastal regions are considered to be the most popular, inland plateaus and mountainous terrain are enjoyed by those who are looking for a bit of diversity during their luxury camping experience. These features make Puglia an ideal spot for a luxury camping destination. 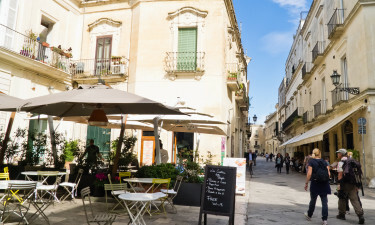 The proximity of Puglia to the warm waters of the Mediterranean have made this region extremely popular. While some camping locations and mobile homes can be found within the more populous areas, many visitors here choose to explore the rather private stretches of sand. Some of these can include Torre Dell'Orso, Punta Prosciutto, Green Bay, Torre San Giovanni and Pescoluse. Notwithstanding the fine beaches, Puglia also boasts some examples of nature at its best. The hills here have been known to produce olive oil since the Roman times; many farms still exist into these present times. Open plateaus stretch for miles and offer truly spectacular views of the countryside while mountainous ranges are very popular with hikers. There are a number of man-made attractions found close to many holiday camping sites. Religious sites such as the Basilica di Santa Croce, Lecce Cathedral and Bari Cathedral should never be missed. The whitewashed houses nestled within Itria Valley are likewise popular locations to visit. Ancient sites such as Castell Normanno-Svevo are unique glimpses into the past. The camping luxury here is often defined by a rich Mediterranean diet; fish, salads and rice are plentiful. Puglia is also known for its distinctive olive oil and selection of tasty wines. The foods here tend to be quite healthy and many locations will serve up cuisine that was collected from the nearby countryside. Consulting with a LUX-camp representative will enable anyone to learn more about this unique Italian destination.